CLEVELAND (AP) LeBron James jerseys in assorted colors hung inside the Cavaliers team shop, their retail price slashed by 40 percent. The day after James announced he is leaving Cleveland as a free agent for the second time since 2010, anger gave way to acceptance. There was still deep disappointment that the world’s best player – Akron, Ohio, born and raised – is leaving again, this time for the brighter lights of Los Angeles and a chance to play with the storied Lakers. If any city knows how to mount a comeback, it’s this one. Once a national punchline for jokes, Cleveland is thriving with new hotels, shops, condominiums and trendy microbreweries popping up on both sides of the Cuyahoga River. Millennials have flocked to live in once-neglected areas transformed into flourishing neighborhoods with hip food and arts scenes. A skyline once dotted with factory smokestacks now features gleaming high-rise apartment buildings. There’s new construction everywhere, including at the Cavs’ Quicken Loans Arena, currently undergoing a $140 million renovation. James made it happen. The LeBron Effect. He put Cleveland on the map, changing the city’s collective psyche and delivering on his promise by winning a championship in 2016 – the city’s first since 1964. On Monday, as news of James’ departure was still sinking in on another scorching-hot summer day, Sherwin-Williams announced that Nike plans to remove the 10-story banner of James on the side of the paint company’s global headquarters that had become a landmark and symbol of renewal. The massive mural, which shows James in his No. 23 jersey with his head titled back and arms extended wide as if to welcome one and all, was also taken down in 2010 when he bolted for Miami. Standing on the sidewalk across from the billboard, Tom Valentino of Painesville, Ohio, snapped some final photographs for posterity. ”I found out it was coming down, and it’s kind of an iconic image here in Cleveland so I wanted to make sure I got a good look at it and got some pictures before it goes away,” he said. Like many Cleveland sports fans, Valentino was initially disappointed to hear James wouldn’t be re-signing with the Cavs. But as he digested this new reality, Valentino chose to reflect on James’ lasting legacy. ”Oh, man. Where do you even begin?” he said. 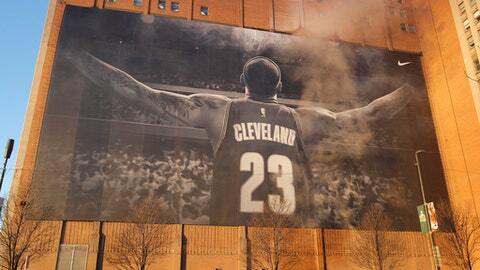 ”The phrase that you hear from LeBron is that it’s bigger than basketball. I really took that to heart as a lifelong Clevelander and just a Northeast Ohioan, and just everything that he has brought to our city and our community and our region. ”And let’s just be honest, the basketball was a lot of fun. Every game you would turn on, you would never know what you were going to see from him, an amazing play, the buzzer-beaters and just everything else that he has brought to the city. Without James, the Cavs instantly went from title contenders to a team that will struggle just to make the playoffs. They’ve dropped on the city’s three-team ladder behind the AL Central-leading Indians who haven’t won a World Series since 1948 but ahead of the woeful Browns, who went 0-16 last season but are optimistic about their future. After James’ choice of L.A. was announced, Valentino’s phone filled with texts from friends weighing in on the decision. There wasn’t hatred toward James, but gratitude. ”I can’t speak for everybody, but know that’s how I feel,” he said. ”It was so crushing when he left in 2010 because it just felt like as a town we were so close to getting that title. And the thing that I’ve come back to over and over the past couple years is June 19, 2016 (Game 7 of the Finals) was the most perfect sports moment I’ll ever get in my lifetime. AP Sports Writer Greg Beacham in Los Angeles and freelance reporter Alan Eskew in Kansas City contributed to this report.